Under the Oak Tree: Ponds revealed! 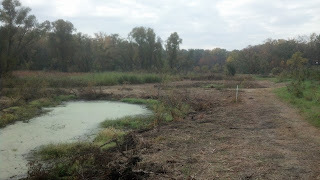 As I mentioned last week, a pond project is underway at the farm. I'm working on removing willows to make the ponds accessible. They will eventually be surveyed and excavated. 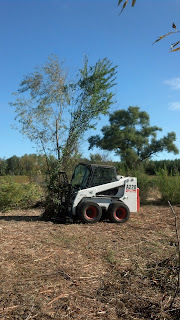 To remove the willows from the site, I've been using the Bobcat with tree shear attachment. Above is an action photo of our tree shear. The shear will cut trees up to 14 inches. It has a grapple attachment that will hold the tree as we move it to either a brush pile or the chipper. This particular model is made by the company Tree Terminator. The shear does get somewhat challenging to use in tight areas. However, it worked great for this project, as this was all out in the open. And here is a completed photo of both ponds with all the willows removed. The next step in this project will be to have a survey completed and than dig out the ponds to the appropriate size.